Beautiful art with eerie storytelling. I wish this was a series. I would so keep reading these. I still intend to read the original stories, but this was great as a visual format to some great classic horror I hadn't yet got around to reading except for one very scary story by Hearn I read in an anthology. If you like Japanese horror movies, check out the source material. Pues en esta tarde de lluvia y llanto, necesitaba mi único consuelo que son los libros. Así que me puse a leer de fantasmas de este autor clásico. ¿Para qué leer el fantasma sin rostro y otras historias de terror?1. Por que te muestran el contexto y la cultura china desde un ámbito de leyendas y cuentos. Pasando de circunstancias de guerra, el amor y lo paranormal. 2. Conocemos a fantasmas bastante escalofriantes cómo la mujer sin rostro, el somebito y la dama helada. 3. Muestra integramente todo lo referente a los emperadores y samuráis mientras te aterra con fantasmas. 4. Existen finales felices, pero también finales muy tristes y deprimentes. Uno de los finales que mas me aterro y me dejo melancólico fue el del desorejado Hóichi. Un excelente clásico de la literatura de terror y fantasmas. (Received from Netgalley for review. )It would be a mistake to go into this expecting spooky ghost stories. That really isn't the intention, though some of these stories are eerie. Luckily, I had already read Kwaidan: Stories and Studies of Strange Things, the source for most of these stories, so I knew what to expect. And I really liked Kwaidan, so I was happy at how much of the original phrasing was preserved. The art is very good, and it suits the stories nicely. Really good as a folklore source, but not really somewhere to look if you want something spooky. The Faceless Ghost is good starting point for those want to read Japanese ghost story. The book includes well know Snow Woman. The drawing is simple and there is some violence in the book to. ARC for NetgalleyThis certainly proves to be an intriguing and charming tale. Saying that a book of the macabre is charming might seem a bit odd, but the visual styling is simply amazing. For me, this work combines both my personal and professional interests. I work for a Japanese foreign mission and over the last few years have become quite passionate about graphic novels. For almost a decade, I’ve also been intrigued by stories of Yokai and Kaidan which I first learned about while teaching in Japan.This work presents some of Hearn’s (he lived in Japan during the late-19th and early 20th centuries and wrote about/catalogued folk and weird tales) stories in a stunning visual medium. They present a variety of creatures, some of whom are benevolent, others cunning, and some are just plain curious. It illustrates their interactions with the people of Japan from centuries ago which helps create a wonderful mood and atmosphere.Like many folk tales of other cultures, there is usually a nice moral tale or allegory at play; be it being about honesty, greed, loss, love, or playing with powers one shouldn’t. This wonderful compilation highlights some of these themes beautifully and unlike modern horror which can serve to repulse a reader, leaves them rather with a creepy, unsettling, and eerie feeling.Although I do have a small background in Japanese history and culture, I’d recommend this to anyone with a passing interest. It certainly serves as an accessible entry point into the spookier side of Japan and the visual representations certainly make these stories come to life. I can only hope that further volumes are produced. Interesting set of tales of the supernatural -- some have the predictable flow of a modern urban legend, while others take unexpected directions. The black and white art style is appropriate, clearly inspired by manga but with more play on tone and facial expressions that matches the "macabre" tone of most of the stories. Love the cover, enjoyed the illustrations and felt like this was a good adaptation of the Japanese tales, I haven't read Hearn's works/translations yet but hope to find copies someday. I have however seen Kwaidan, and other classic Japanese ghost tale which I love and became a more recent interest. I went ahead with reading this to add more eerie fun for before Halloween season ends. While the majority of stories were familiar to me a couple weren't and I found those just as interesting. All in all a solid collection and quick read of the macabre. Also give this more of a 3.5. Art is good and I liked (enjoyed?) some of the stories but it wasn't as good as I expected. 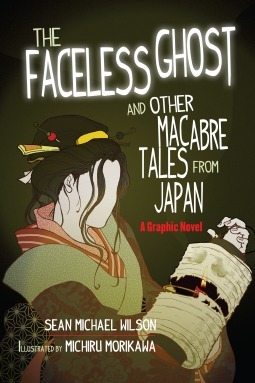 Lafcadio Hearn's The Faceless Ghost and Other Macabre Tales from Japan is a collection of six of traditional Japanese ghost stories told in graphic novel format by Sean Michael Wilson. All of them are very well known in Japan, where ghosts and demons are often called yokai, meaning "the mysterious and weird." Today these stories find expression mostly in movies and manga, but they remain rooted in the traditional ghost stories of the Edo era known as kaidan, which means "recited narrative of strange, mysterious, rare, or bewitching apparitions." The book includes an afterword by William Scott Wilson, the esteemed translator and editor of Japanese texts and samurai philosophy, who puts the stories into historical context.Lafcadio Hearn's The Faceless Ghost and Other Macabre Tales from Japan is a good look at some of the traditional stories from Japan. I love learning about the folklore and legends from different parts of the world, and while two of the stories seemed vaguely familiar to me, the complete stories were new to me. I found it fascinating that despite the fact that these are ancient legends from the other side of the world, some ideas are consistent with the urban legends of my own region. I think it is important for readers to see that despite our differences and distance some parts of human existence is shared without ever having crossed paths. The black and white artwork was very well done and captured the emotion and atmosphere of the stories. The collection was a solid read, and while it did not keep me up at night, it certainly had a creepy vibe that stayed with me for a while.Lafcadio Hearn's The Faceless Ghost and Other Macabre Tales from Japan is an interesting and entertaining collection of traditional Japanese ghost stories. I would recommend it to young adults and adults that enjoy ghost stories and legends, particularly those from other cultures. Sean Michael Wilson and illustrator Michiru Morikawa’s adaptation of nineteenth/early twentieth century western student of Japanese culture, Lafcadio Hearn, was a very interesting visual interpretation of the haunting folk stories and legends collected by Hearn. While not quite a “young adult” book, Lafcadio Hearn’s folklore and ghost stories gleaned from his travels across Japan are definitely appropriate for teens, and this comic makes good use of that. While a bit gruesome (with a few severed heads, torn off ears, etc.) the stories here are eerie and suspenseful, in particular my favorites “Hoichi the Earless,” “Yuki-onna,” and, of course, “The Faceless Ghost.” Morikawa's manga style art offers a fun introduction to these classic tales. For anyone interested in Japanese culture, these manga style adaptations should be very interesting, and introduce younger readers to Japanese history and society in addition to spooky (spooky, spooky) ghosts and other yokai.For more young adult graphic novel adaptations of fantasy literature, check out my BookLikes blog, Reading Rainstorm, here. I'm not a big fan of Lafcadio Hearn, a Victorian Gothic writer who translated Japanese tales of the macabre at the turn of the 20th century. I always doubt whether Hearn was true to his sources as his tales of demons, spirits and yokai are so much more gentle than folktales I've become familiarized with through massive amounts of manga. However, these are slightly strange tales, a little odd, hardly macabre, but pleasant enough reading for a slight shiver. The art is much more satisfying and well done. As mentioned in the author's note, these stories were long ago collected by the writer Lafcadio Hearn, who lived in Japan in the late 19th Century. Filled with ghosts and other frightening apparitions, these tales are quite dark and unsettling (except for "The Gratitude of the Samebito", which was sweet). The illustrations are haunting and done in the manga style with a bit of Western style thrown in. Very good for those who like macabre Japan. At first I was put off by what seemed to be too much narration vs. dialogue, but then I read at the end that the editor tried to preserve Hearn's own words as much as possible. There are some wonderful stories in here and Wilson has done a nice job arranging them so that they flow together nicely with one another, ending on a high note. The artwork is quite lovely, enough that the black & white illustrations suit the text just fine. This collection is the perfect read for anyone interested in folklore, ghost stories, or Japan (or all of the above)! I finished each story wanting more details and more information, but the mystery is part of what makes them so fascinating. Not knowing the answers keeps the reader thinking about these stories long after the book is closed. The artwork is great too. The cover is gorgeous and part of me wished the entire thing had been in color. Overall, a quick and intriguing read. The artwork resembles classic Japanese art style, quite fitting for these stories. They very well paced, with just the right amount of story being told with pictures and words. Faceless Ghost and Hoichi were esp. well done. I managed to snag a free copy from one of the VA Guests, and I really dig it. TI know most of the stories [who doesn't], and Wilson’s adaption of them is very easy to read, and Miyabi’s artwork was very done; it blended with the plot styling and just made for a keeper. This is a beautiful collection of six mysterious folk tales from Japan. The text and artwork complimented each other very well. I agree that if this were a series I would read more, and I will definitely try to check out more of the novels that Wilson and Morikawa have worked on together. Macabre tales from Japan. Nicely illustrated. Incredible! Great artwork, great writing! Good graphic interpretation of classic Japanese folktales. Plus, it has Hoichi the Earless, one of my favorite tales ever! Reading Challenge 2018 -Bookish: book inspired by Asian mythology or folklore. A quick read, this graphic novel is full of ghost stories from Japan. I had not heard of any until today and thoroughly enjoyed them. They left a sad feeling at the end of each, even though they were scary at times. I liked the art. I liked the stories. I didn't like the way the stories were told. They were presented straight up, without any tension or build up and then, more often then not, they just ended, or went off on a weird ellipsis. I'm not necessarily into the macabre as a rule, but I did quite like these. (This is not a horror collection, just ghost stories.) The stories were collected and written by white men, but the artist is a Japanese woman. It was alright. The art didn't tickle me pinkReview to come. Selección de cuentos japoneses recopilados a finales del siglo XIX en formato gráfico. Muy entretenidos. Follows Hearn's language, which is older and awkward, but the graphic presentation of these stories is really well done. A very solid adaptation of Hearn's texts into a graphic novel format. Sean Michael Wilson Michiru Morikawa William Scott Wilson - Sean Michael Wilson is a comic book writer from Scotland. He has had around 30 books published with a variety of US, UK and Japanese publishers, including: a comic book version of A Christmas Carol ('Best of 2008’, Sunday Times), AX:alternative manga ( 'Best ten books of 2010’, Publishers Weekly), Parecomic (with an introduction by Noam Chomsky, his first contribution to a book in graphic form). He is currently writing books for big Japanese publisher Kodansha, being the only British writer to do so. In fact, he is the only pro manga writer from Britain who lives in Japan. He is also the editor of the critically acclaimed collection 'AX:alternative manga' (Publishers Weekly's 'Best ten books of 2010' and nominated for a Harvey award). Working with various Japanese artists he has written a unique line of Japanese history/martial arts/Samurai books, including The Book of Five Rings, Secrets of the Ninja, The 47 Ronin, and Cold Mountain (winner of China Comic and Animation Competition 2015 ‘Best Overseas Comic’ award). In 2016 his book 'The Faceless Ghost' was nominated for the prestigious Eisner Book Awards, and received a medal in the 2016 'Independent Publisher Book Awards'. In 2017, his book Secrets of the Ninja won an International Manga Award from the Japanese government - he is the first British person to receive this award. His main influences remain British and American creators - such as Alan Moore, Grant Morrison, Eddie Campbell and Harvey Pekar. He often gives lectures and talks about comics in schools and colleges, and writes articles for such places as The Japan Times, The London Economic and The Herald Scotland.